A1059 M9282LL. 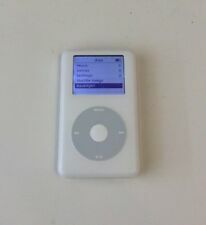 APPLE IPOD CLASSIC 4TH GENERATION - 20GB - WHITE. We will do our best to make it right! Used, 100% tested, fully functional. Physical Condition: 8/10. Storage: 16 GB. Category: iPod. Generation: 2nd. Relax 32GB MP3 4TH GENERATION MUSIC MEDIA PLAYER WITH MUSIC VIDEO PHOTO US 1.8” Screen with built in rechargeable battery & internal memory • 32GB built in memory hold up to 4000 song • Supports the following audio formats: MP3, WMA, ASF. Supports video format:AMV ( Does not support Itunes) •Small and light design makes it convenient to carry and use • The camera lens can cause the colour settings to be affected by light and the LCD therefore the theme colour and picture may differ slightly BE THE BEST BUY THE BESTItem Description . Up for bid is a Sandisk Sansa Clip MP3 player. It is a 2gb but also takes an external micro SD card so you can have as much storage as you want. It’s really nice because it’s small and just clips to your shirt,sleeve,etc. Does not come with a cable but it is just a basic mini usb cable. Play Music with Fiio ! World's first Bluetooth amp to support all wireless sound formats: AAC, SBC, aptX, aptX LL, aptX HD, LDAC, and LHDC (HWA). Premium Qualcomm CSR8645 Bluetooth chip independent AK4376A DAC. We are very accommodating and will be more than happy to fix any problem. =============. ==============. ============. I forgot I even had this floating around, it's a little beat up but was rarely used so the battery is good and it works perfectly fine. APPLE IPOD TOUCH 4TH GENERATION - 32GB - BLACK. Physical Condition: 8/10, overall good condition. We will do our best to make it right! Our warranty covers manufacturer defect ONLY. What You Will Get. New ListingApple iPod touch 4th Generation Black (32 GB) Free Shipping! Apple iPod touch 4th Generation Black (32 GB). Condition is Used. T his is for the iPod only. The iPod is in perfect working condition. The iPod only shows typical signs of use. Trending at $38.49eBay determines this price through a machine learned model of the product's sale prices within the last 90 days. 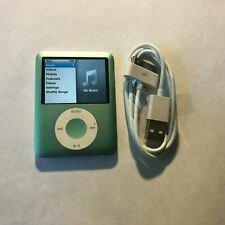 Apple 4GB iPod Nano 3rd Generation Silver MA978LL. Brand new battery and back cover installed. Condition is Used and play/pause button works, but is a little tricky. No cables or earbuds included. I ship FAST! APPLE IPOD TOUCH 4TH GENERATION - 32GB - WHITE. CONDITION: 8/10 (see photos). WHAT’S INCLUDED Used, 100% tested & fully functional. Sides/corners: Minor nicks. 365 ARCHOS UNITS SOLD. SEE WHAT LOTS OF OTHER ARCHOS WINNERS SAY! TRY DRIVING AT 70MPH AND FINDING A SONG ON AN IPOD. YEAH RIGHT!AND 160GB'S IS A LOT OF STORAGE! I HAVE OVER 600 SONGS IN MY 80'S FOLDER AND ALMOST 400 SONGS IN MY 90'S FOLDER AND STILL ADDING MORE! I have 9 of these available. 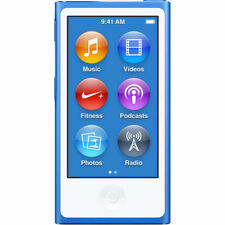 You will receiveone of the iPods shown in the pictures. They are all 3rd gen 32GB. As you can see they are all in good used condition with no cracks or scratches. They are all working great no known issues. Trending at $33.11eBay determines this price through a machine learned model of the product's sale prices within the last 90 days. Apple iPod Touch 6th Generation 32GB Blue MP3 Player In Box. Apple iPod Touch 6th Gen 32GB Blue. Screen Itself In Perfect Shape, Body With Minor Blemish (Small Crack) At Bottom Left. Reset & Ready For New User & iTunes Sync. This is a new Yellow PONO player Hi-fi(24-bit,FLAC,ALAC,WAV,etc. )portable music player, developed by Neil Young. Pono - High Resolution Audio Player. Pono is the culmination of Neil Young’s goal to bring the quality of music that he and other artists experience in the studio to everyone.